This soup totally lived up to it’s name. It was so quick and so easy to prepare. Did I like it? Not so much. But the concept is brilliant and one that I will riff off of when this project is complete, or I run out of soups to make from this cookbook. Was it easy to make with readily available ingredients? So easy! All frozen vegetables, carrot juice and almond milk. Plus some no salt seasonings. What specifically did I like about the recipe? The ease of preparation. What specifically didn’t I like about the recipe? The soup is simply too sweet for me. Which is totally bizarre, because I love sweets! Did my husband like it? He totally loved it! Did my teenage daughter like it? It was a surprise to me, but she liked it a lot also. Did my eight or five year old try it? Truth? I told my eight year old daughter that I would pay her $1 to eat three bites or $2 to eat a small bowl of this soup. She took one taste and ran out of the room screaming. What did she eat for dinner? A bowl of plain romaine lettuce, whole wheat pasta with no salt tomato sauce and a big bowl of grapes. She reminded me that kids’ taste buds are not as developed as adult taste buds. She learned this at school. Thank you Maya. Would I make it again? Yes, but . . .
Is there anything I would do to improve on it if I made it again? I would skip the carrot juice and use low sodium vegetable broth instead. Plus, I’m thinking that I would like a version of this soup where frozen broccoli (or cauliflower or asparagus) was blended into almond milk for a cream of broccoli soup. There really is so much you could do with this idea. Overall Grade (completely unscientific, I admit): A+ for the concept, B for the actual recipe’s taste (IMHO, but the husband would give it an A). 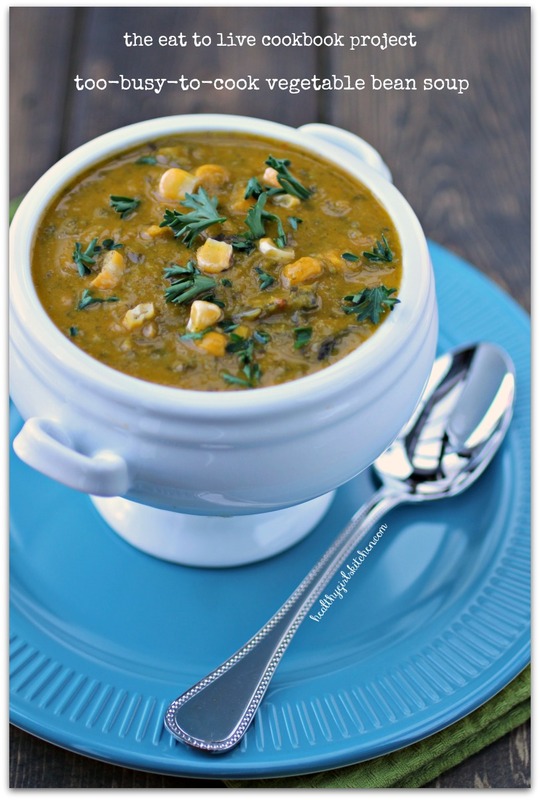 Have you made Dr. Fuhrman’s Too-Busy-To-Cook Vegetable Bean Soup? What were your impressions? Leave a comment below.